Our Drama Club performs twice during the school year. 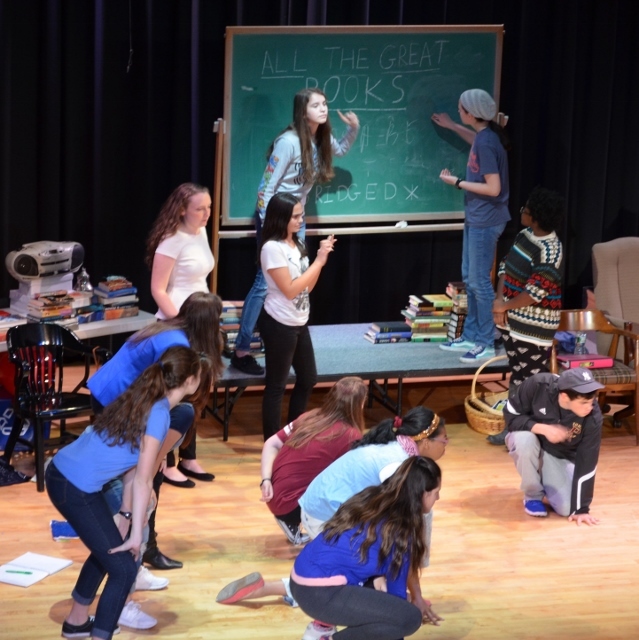 In the fall, our thespians present a drama and in the spring, they perform a musical. 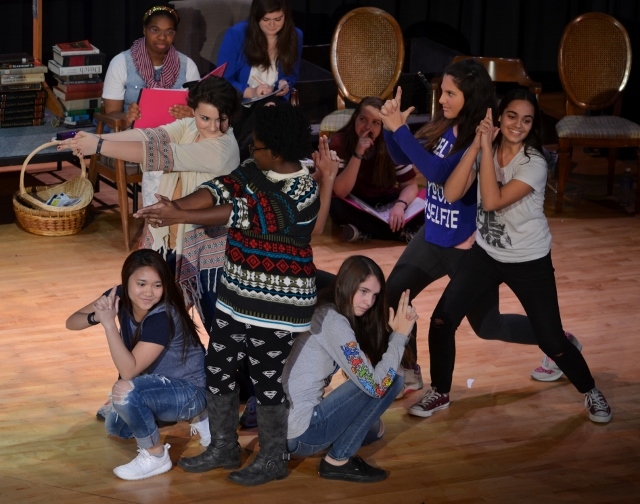 The middle school presents a drama workshop in the spring. The Ursuline School Drama Club was certainly "All in This Together" performing the energetic stage version of the 2006 Disney film "High School Musical" in April 2018. Alexa McRedmond and Owen McKinney, as Gabriella and Troy, were great romantic leads. Their vocal harmonies and their immediate chemistry drew in the audience. Amanda Moss delivered a compelling portrayal of Sharpay, the musical theater diva with a sassy attitude. Sharpay's twin brother, Ryan, was played by CJ Cotza, who brought an earnest and sympathetic quality to the character. Meghan Hartson, as Gabriella's friend, Taylor, who is president of the scholastic decathlon, sang with her characteristic emotion and excellent phrasing. 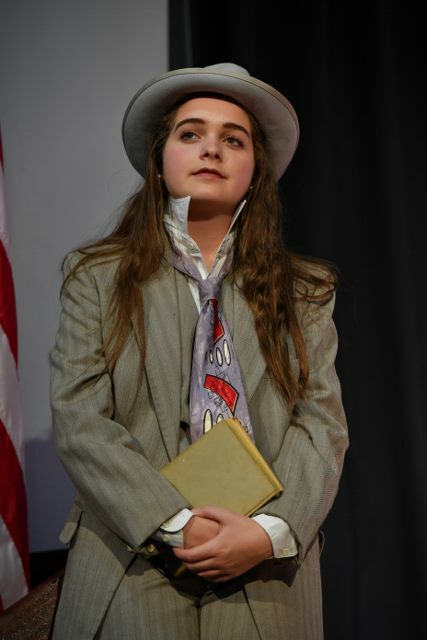 Olivia Ross was outstanding in her portrayal of Ms. Darbus, East High's eccentric homeroom and drama teacher. Caralyn Fitzpatrick captured the creativity and quirkiness of Kelsi, the aspiring composer. Edie Anne Reidy's direction was sharp and well-paced. One highlight of the excellent choreography was during the song "Get'cha Head in the Game" when the basketball team members adeptly synchronized their basketballs. The cheerleaders, led by dance captain Jennifer Nunez, expertly performed cartwheels and encouraged the crowd. Michael Ficocelli's musical direction supported the strong vocal solos throughout. The costumes very clearly expressed the qualities of the different high school cliques which are central to the story. It was evident that the whole cast was totally committed, and the heart of the show really came through. Just as dedicated was the Tech and Stage Crew under the direction of Pat Schifini, OSU. Shout outs to Morgan Blank, Jules Leone, Grace Smyth, Ariana Guzman, Danielle Clifford Johnson, Gianna Gerbasi, Isabella Gerbasi, Victoria Gerbasi, Jenna Kriegel, Kaitlyn Wertlieb, Morgan Wertlieb, and Katherine Mehler. A tip of the hat to the cast and crew of "It's A Wonderful Life" who performed beautifully in The Auriana Theater shortly before Thanksgiving 2017. The audience tremendously enjoyed a seamless performance by the students. Many people have seen the 1946 film version of this classic Christmas story, which starred James Stewart as George Bailey, a man who had given up on his dreams and on life. You may recall the guardian angel, Clarence, who helps George appreciate his worth. The play reaches all with its message that every life touches so many others. You must appreciate what you have while you have it and not take the small things for granted. It is Zuzu, George Bailey's daughter, who says to her father the famous line: "Look, Daddy. Teacher says, every time a bell rings an angel gets its wings." 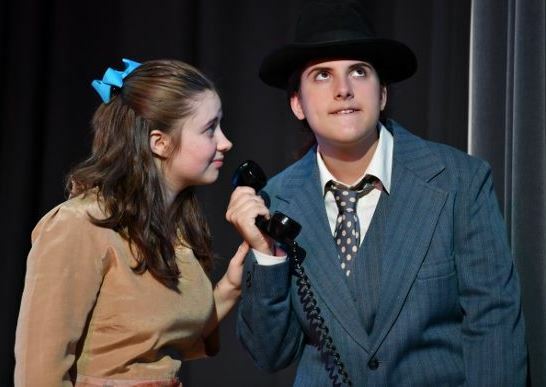 Outstanding leadership by senior Meghan Hartson as George Bailey and junior Amanda Moss as Clarence throughout the rehearsal process brought forth a touching and moving performance by the cast. Alexandra Sayegh, Claire Queenan and Caralyn Fitzpatrick had remarkable moments in the show. You could see the cast truly bonded and made every effort to perform at their best. The show flowed beautifully and the backdrop was stunning. We thank Chris Pope of Pope Photography for the excellent photos. Hats off to the performers in the Middle School Musical Collage, "Camp Koala." 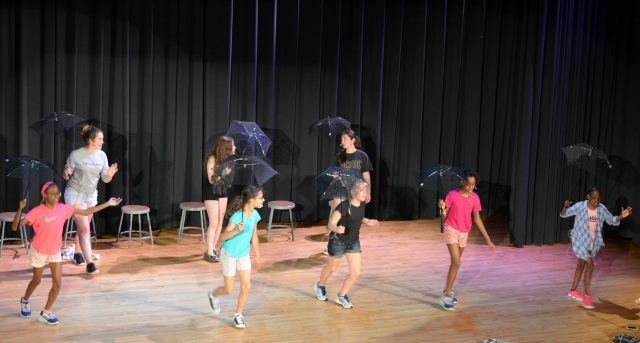 This workshop in May 2017 featured selections from Disney films ("Mary Poppins"), contemporary songs ("Fight Song") and classics ("Singin in the Rain"). The musical pieces were selected by the girls and certain of the scenes were written by the girls. Leigh Brown also performed on the piano and showed us her soft-shoe skills. The joy and pride were evident as the girls presented their musical collage. "One last kiss!" Our marvelously talented singers and actors presented an outstanding production of "Bye Bye Birdie" in March 2017. The audience was immediately captivated by the story. The solos were exceptional – in particular "How Lovely to Be a Woman" by Emma Harvey '17 (Kim MacAfee), "An English Teacher" by Ciara McAloon '17 (Rose), and "A Mother Doesn't Matter Anymore" by Meghan Hartson '18 (Mae Peterson). The strong vocal performances by the ensemble were not surprising, as a number of our thespians are also members of our choirs and experienced, talented singers. The whole cast brought energy and showed that they were having fun! We thank the cast as well as the stage and tech crew for their hard work and dedication. Our Drama Club presented "12 Angry Jurors" in November 2016. The play is an adaptation of Reginald Rose's 1954 hit "12 Angry Men." The whole play is set in a jury room on a hot summer day. The jurors are asked to decide whether a 19-year-old man is guilty of murdering his father. Initially, the jurors vote 11-1 for guilty but, since they are required to reach a unanimous verdict, animated conversation ensues as evidence is re-examined. At certain intervals, the action was suspended as the judge and two lawyers addressed the audience and asked audience members for their opinions on the issues raised. The actors delivered the difficult, elaborate dialogue with poise. Violet Lee Cadet gave a wonderfully nuanced performance as the initial dissenting juror and Amanda Moss, the last juror to agree to the final verdict, was compelling as she displayed restrained anger. In April 2016, our cast and crew put on the musical, "Little Women." The girls interpreted Louisa May Alcott's masterpiece with sensitivity and grace. Marianna Ceccatti '17, Elizabeth Vuksanaj '16, Diana Moss'16, Sarah Cosmedy'16, and Sandile Mhlaba'16 vocally dazzled us in their leading roles. Emma Harvey '17 was a delightful narrator as the author. Particularly poignant was Betsy Vuksanaj's stunning death scene as Beth March. The ensemble delighted and the period costumes reminded us of a young America struggling during the Civil War. In November 2015, we were delighted by the comedy "All the Great Books, Abridged." Our actors enjoyed performing parodies of 88 books, in short scenes or one-sentence summaries. From "Animal Farm" to "Harry Potter," the range of books presented was amazing. Ensembles of actors moved smoothly from one "book" to another. Multiple references to modern-day TV shows and songs caused the enthusiastic audience to laugh heartily.